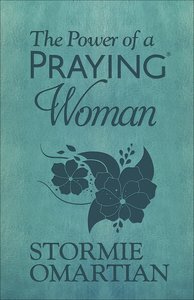 About "The Power of a Praying Woman"
Omartian is a bestselling author who personally connects with readers by sharing experiences and lessons that powerfully illustrate how God changes lives when we learn to trust in Him, live His way, seek His will, and follow His lead no matter what the circumstances. The strength and transparency of Stormie Omartian's message has driven her books to the top of bestselling lists and earned many prestigious awards. More than twelve million copies of The Power of a Praying ... series, which includes such books as The Power of a Praying Wife, The Power of a Praying Parent, The Power of a Praying Husband, The Power of a Praying Woman, The Power of a Praying Teen and The Power of a Praying Kid. In May 2002, The Power of a Praying Wife broke a 21-year industry record by becoming a #1 bestseller for 27 consecutive months. It has stayed on the bestsellers' list for over 9 years. In 1998, it was named a Gold Medallion Finalist and in 2001, 2002, and 2003, for an unprecedented three years in a row, it was named a finalist for The Charles "Kip" Jordan Christian Book of the Year Award. The Power of a Praying Husband spent 32 consecutive months on the bestsellers' list - also reaching the number one position and was honoured in 2002 with a Gold Medallion Award. Omartian's other bestselling books are Stormie, Just Enough Light for the Step I'm On, The Prayer That Changes Everything, and her children's book, What Happens When I talk to God? In The Prayer That Changes Everything, Stormie Omartian passionately inspires people to look beyond themselves, their circumstances, and their needs so that they may experience the amazing things that take place when prayers of praise are lifted up to God. She encourages men and women to praise God during times of difficulty, sorrow, fear, abundance, and joy as a first reaction rather than a last resort. Sharing personal stories, practical principles, and biblical truths, She offers step-by-step instruction on how to develop a consistent attitude of praise, worship, and thanksgiving to God. A sought-after media guest, Omartian has been interviewed numerous times on The 700 Club (U.S.) and many other national television and radio programs. She has also been featured in publications such as USA Today, Shine, Profile, Publishers Weekly, Today's Christian Woman, and Marriage Partnership. As a young singer, dancer, and actress, Omartian appeared on The Dean Martin Show, The Glen Campbell Show, The Mac Davis Show, The Smothers Brothers Comedy Hour, and many other variety shows. She also sang backup for Glen Campbell, Neil Diamond, The Imperials, and other well-known artists. Omartian and her husband, Michael, have written hundreds of songs, including the Christian musical, Child of the Promise. They have put together a praise and worship CD, also called The Prayer That Changes Everything, released by Integrity Music. It is a beautiful collection of familiar worship songs sung by various Christian musicians, plus original music by Michael and Stormie. Stormie says, "Michael has written some of the most beautiful music I have ever heard on this CD. It makes me cry every time I listen to it because I sense the Spirit of the Lord in it." The Omartians have been married for more than 35 years and have three grown children. Her latest books include The Power of a Praying Life, The Power of Praying Through the Bible, and the long awaited follow-up book to The Power of Praying Wife and The Power of a Praying Husband which is called The Power of Praying for Change in Your Marriage.